MH900 Series – Up to 500tph! 1500 Series – Up to 1000tph! 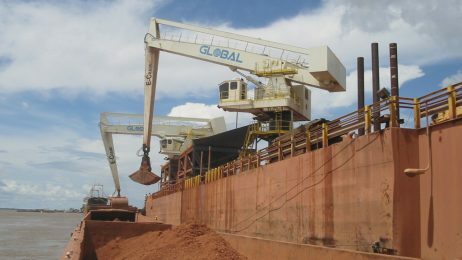 Many ports are faced with problems such as congestion, no land for expansion, and costly outdated infrastructure. 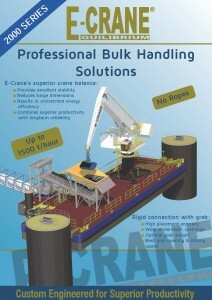 E-Crane has the ideal solution to solve these problems by moving bulk handling operations to the water. 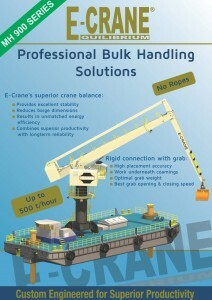 The balanced design of the E-Crane results in significant energy savings, and it also makes the E-Crane ideal for mounting on a floating barge. 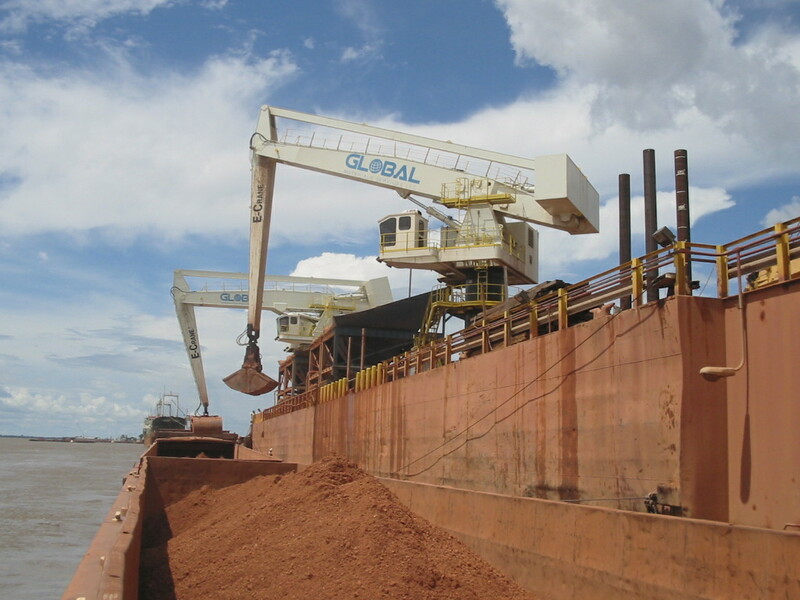 Because of the E-Crane’s excellent stability, the movement of the E-Crane causes very minimal listing and movement of the barge and smaller barge dimensions are required to accommodate the E-Crane. 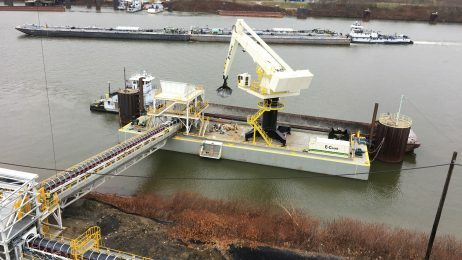 A barge mounted solution is also beneficial because it floats up and down along with material barges and ships as the water elevation fluctuates. This means that a single midstream transfer cycle is never affected by water level changes and no additional cycle time is added to compensate. 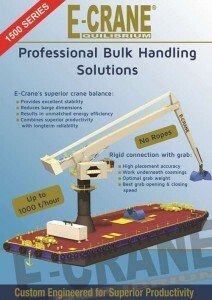 Additionally, an E-Crane installed on a barge can be built and tested locally and then floated to its final destination. 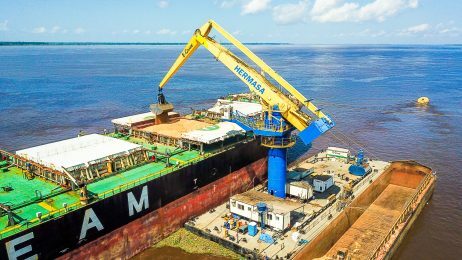 This can eliminate costs and difficulties of local logistics and marine construction. 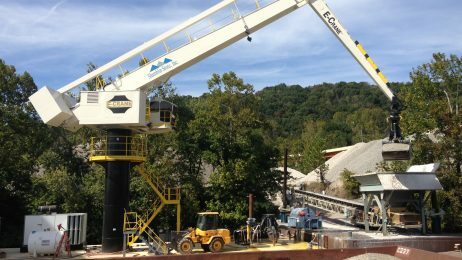 Thanks to its modular design, floating terminals can also be moved and relocated easily, optimizing the setup, making bulk handling faster and more efficient. 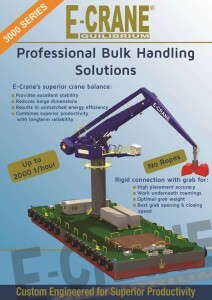 The E-Crane design also allows for a rigid connection with the grab (unlike cable cranes) which results in high placement accuracy and fast grab open/close speeds. The 1500 Series floating solution and the 3000 Series floating solution can achieve production rates of up to 1000 t/hour and 2000 t/hour, respectively. 2000 Series – Up to 1500tph! 3000 Series – Up to 2000tph!